Free outdoor concert featuring K'Naan (Wavin' Flag) and learn about outdoor activities to celebrate Parks Canada's 100th birthday! Similar celebrations will be held in Montreal and Toronto. Olympic Gold medalist Maelle Ricker (Snowboarder) will also be there. Bring the entire family down to learn about our parks and enjoy the music and food and cake. Did I mention there will be cake? While you are down at Stanley Park for Parks Day, why not stop by the Lumbermans Arch where Vancouver's largest water fight will be taking place. This is a sort of flash mob event and I think it happens annually. Make sure you bring a change of clothing if you are planning to participate! Times Telecom is again sponsoring an Elise Estrada concert. I watched her sing at a previous Times Telecom sponsored event at Metrotown and there were a LOT of people there. She's a very good singer! There will be food and drinks provided at this event and chances to win prizes like a smartphone! 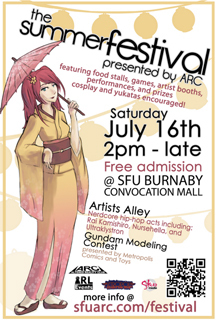 If concerts and water fights aren't your thing, Altered Reality Club, SFU's gaming and anime club is hosting an outdoor summer festival at Simon Fraser University. It's a free event and there will also be opportunities to win prizes! There will be food stalls, craft booths, artists, vendors, live performances and tons of carnival-type games where you can win raffle tickets for prizes! First horse race is at 3:20 p.m on Saturday, 1:50 p.m. on Sunday with wiener dog racing scattered in between horse races. This should be a fun event. Again there is no admission to the racetrack and the races are free to watch. 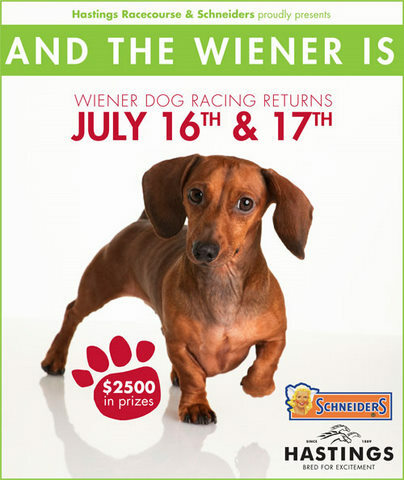 These cute dogs will race a small portion of the track in a total of 8 heats and the final race will be on Sunday. Of course what is the weekend without a movie? Pre-movie action starts at 6pm and the movies start at sunset. Note that all of these are weather-dependent.